and what ammunition you have with you. If needed, you can jettison weapons at sea. 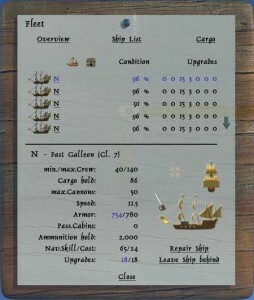 At the bottom you can see how many ships you got in your current fleet. 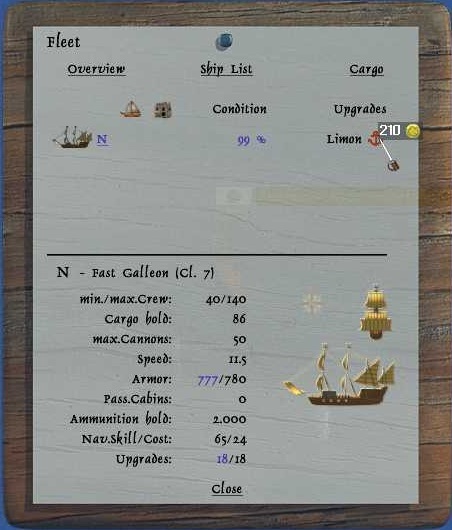 Min.Nav.Skill shows how much navigation (nav) you minimum need to sail your fleet out of your total nav. Nav.Cost shows how much of your nav you are using out of your toal nav. Pass.Cabins shows how many cabins you are using out of your total cabins. Anchor fee total is how much gold you pay per wop day in anchor fees. Always repair fleet if possible is something you should have ticked, to be able to repair at sea when possible. detailed description of the ship at the bottom of the window. 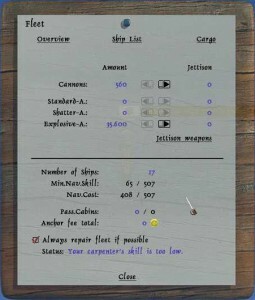 Here you can force repair onto the selected ship, if you are able to repair it. damaged and you desire to leave it at sea. when leaving a ship like this, unless it is your last ship. where after a line will appear showing the time it takes to leave it behind. Not recommended when enemy nearby. 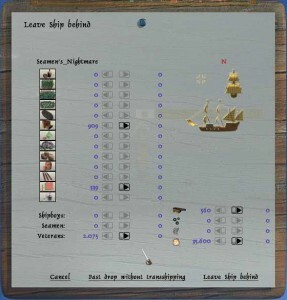 When you are in the ship list you can choose to click the little house to be able to see the ships you got in cities. 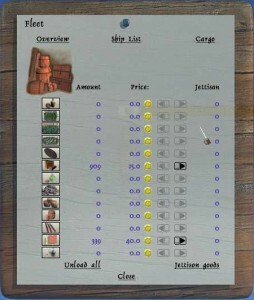 Here it will show a little red anchor if they are moored and by holding the curser over it you can see the anchor fee. is moored or if a ship is done being build.You can also see the ships you left in repair. 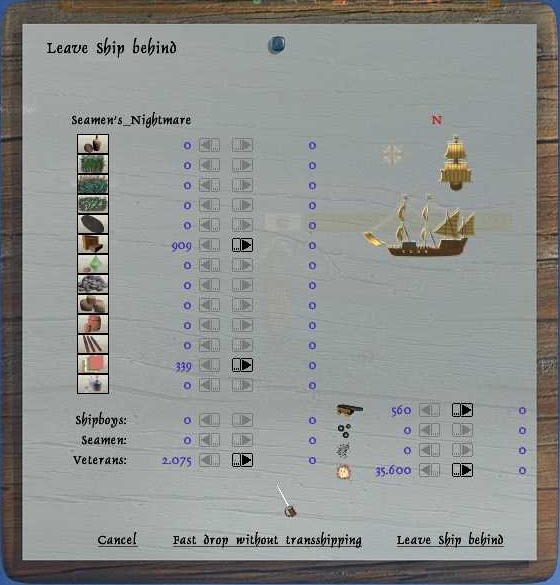 By clicking a ship you get detailed description of it at bottom of the window. You can click the little ship to get back to your current fleet. If you click cargo you can see what cargo you got with you. It is possible to unload a few items or use unload all at the bottom, if you desire to jettison some or all of your goods.